Coach Zlatko Dalic has urged Al Ain fans to lay off Nigeria striker Emmanuel Emenike after he was booed during a UAE league match on Saturday. 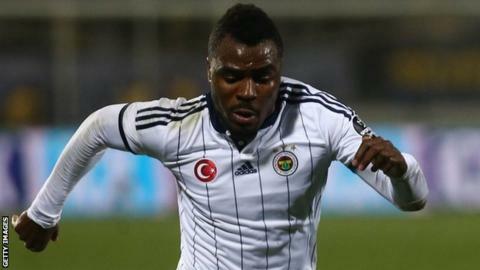 Emenike, on loan from Fenerbahce, has scored four goals in seven games for the league leaders. But he was jeered by a section of his own supporters when he was substituted in the 86th minute against Al Jazira. "Please, our fans, be patient, give everyone a chance, to me, to my team, to Emenike," Dalic said. "I cannot be happy with the reaction of some people. We won, we played fantastic and some people criticised Emenike. "It's not easy, but we didn't deserve this reaction, especially after the Jazira game. It was very bad. "I understand our fans always want a fantastic performance, always five goals but it's not possible. "Please, support our team and our players will play better. In the last game, in front of 15,000 people, my players were fantastic. I expect it to always be like this and they support our team." Emenike joined the Emirates club in July as a replacement for Ghanaian Asamoah Gyan, who scored 128 goals, won three domestic league titles and was top scorer in the Arabian Gulf League three times in a four-year spell. Dalic has warned the fans not to expect Emenike to replicate Gyan's success. "The last game we won Emenike was part of our victory. For me, he played very well, did a great job, but only missed scoring a goal," said Dalic. "Maybe it was Emenike's best performance for me. I know everyone expects more goals, expects him to be a replacement for Asamoah Gyan. As I told you on his first day, it's not easy to replace Gyan. "If somebody needs criticism, criticise me, not my players. Because I put him in the team, I put him on the pitch; I will take everything on my back. But give support to my players." Emenike, who announced his retirement from internationals last month, is no stranger to controversy. Back in March he demanded to be substituted after being booed by his own fans duringFenerbahce's 1-0 home win over rivals Besiktas. Emenike reacted angrily to jeers after losing the ball and took his shirt off, storming off the pitch, only be to be talked back on by his coaching staff. He was replaced at half-time. Can Cosafa Cup regain prominence? Read more on Can Cosafa Cup regain prominence?